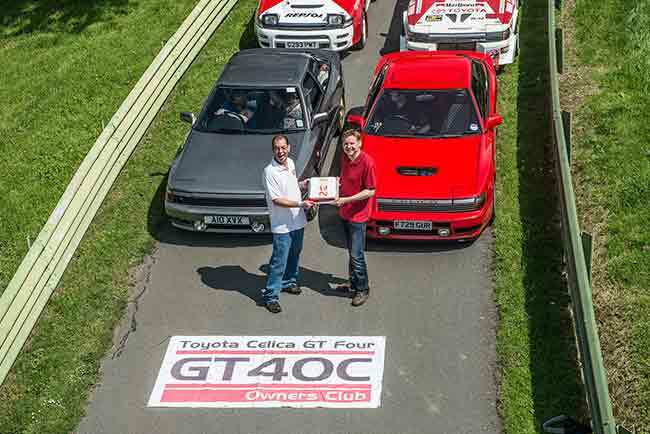 Toyota fans recalled the dominance of the Japanese manufacturer in the World Rally Championship on Sunday 1st June, when the GT-Four Owners Club celebrated the 20th anniversary of the Celica GT-four ST205. Around 50 cars gathered at the Prescott Speed Hill Climb in Gloucestershire, where they got the chance to put the Celica’s rally-winning speed and handling to the test on the famous course. ST205 cars, based on the sixth-generation Celica, were joined by earlier ST165 and ST185 GT-Four models. Developed with help from Toyota Team Europe, the reigning World Rally Champions at the time, the ST205 was a road car with competition-winning pedigree in it’s DNA. The Celica’s 2.0-litre four-cylinder twin-cam 16 valve engine was modified with a larger, water intercooled turbocharger and reworked valves and ports. This increased the engines power to 239bhp. With permanent four-wheel drive, it could accelerate from nought to 62mph in 6.1 seconds and go on to a top speed of 153mph. It proved a winner at the highest level, where WRC driver Didier Auriol drove his on to Toyota’s third consecutive WRC manufacturers title. Toyota helped the GT-Four Owners Club celebrate with a appearance from their mighty Lexus LFA super car, where a prize draw for LFA passenger rides up the hill climb in the super car raised £400 for charity.